For some time now, Harjinder Singh Dilgeer has been flaunting all the characteristics of a turncoat and a sacrilegious traitor. It had become quite obvious that Dilgeer, once on a pay-roll of the premier Sikh body SGPC, who was writing as per Sikh traditions and scriptures, had become the pallbearer of the anti-Sikh forces and mutated into a Sikh adversary when he started questioning the same traditions and scriptures which he once vouched for. This change was so sudden that an external hand in this transformation could not be ruled out. Just a few years ago he was quite active in the process that culminated with the excommunication of Kala Afghana from the Panth and was attending and addressing meetings for this purpose. And how, only after few years, he jumped into the same band-wagon of this notorious club of Kala Afghanis, which he himself vehemently once opposed, is quite amusing. Earlier he was writing about Rehat Maryada, Sikh traditions, philosophy and now all of a sudden he started writing against his own beliefs. A few months ago Dilgeer made headlines when he printed and distributed a booklet which he named ‘nitnem’, from which he mischievously removed ‘Jaap Sahib’, ‘Tve Prasad Savaiye’ and ‘Chaupai Sahib’. His anti Sikh stance was getting clearer from the company he was keeping. It was from Dilgeer’s stage that excommunicated-Sikh Joginder Sahni of Spokesman newspaper declared in a lecture that Guru Nanak Sahib was not in favor of bestowing Gurgaddi to any other Guru after him. 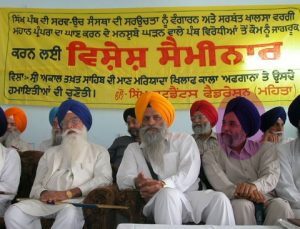 Towing the line of turncoat Darshan Singh Ragi, Dilgeer also became critical of Sri Dasam Granth, the second most respected Granth of the Sikhs, and the source of Khalsa nitnem, amrit and ardas. Ironically, like Ragi, Dilgeer too had lots of respect for the banees of Sri Dasam Granth until few years ago. And like Ragi, Dilgeer too became a renegade challenging his own writings and beliefs. Why he chose to become a sellout is quite amusing if not surprising. Recently a propaganda video has emerged where Dilgeer is being interviewed on Sri Dasam Granth. With the contentions Dilgeer has presented in that interview it has become crystal clear how intellectually bankrupt Dilgeer is when it comes to knowledge on the content and history of Sri Dasam Granth. With half baked knowledge and tampering with the historic sources, Dilgeer has tried to present himself as a scholar of Sri Dasam Granth. However he has not only failed to present any substantiated claims, but also exposed himself with his nonstop jabbering against Guru Gobind Singh Ji’s banees. He seems to be so occupied with his blabbering in the interview that he doesn’t even realize that he is giving self contradictory statements. For instance at one point during the interview he even criticizes Giani Gian Singh and Kavi Santokh Singh. And at the end of the interview he concludes his argument by giving a quote from Giani Gian Singh’s work. At one point he condemns Damdami Taksal and its Mukhis including Sant Jarnail Singh Bhindrwanwale for propagating the compositions of Sri Dasam Granth. And at another instance he blames RSS for propagating Dasam banee, which he argues is done, so that the Khalistan movement could be derailed. Sant Jarnail Singh Bhindranwale was the embodiment of Sikh sovereignty movement who sacrificed his life for it. He had immense shardha for Sri Dasam Granth and regularly did katha from all its compositions. Hence Dilgeer’s above contention is not only bogus and factually incorrect but it is also fabricated like rest of his claims. In the beginning of his interview, Dilgeer, playing as a protector of Sikh Rehat Maryada, claims that only Jaap Sahib, 33 Sawaiye and Akal Ustat compositions are part of Khalsa nitnem. Then he throws his salvo against the other banees of Sri Dasam Granth including Chandi Di Var, Charitropakhyan and Chaubees Avtar. For the information of the readers, the fact is presented here: The first pauree of our ardas comes from Chandi Di Var. Benti Chaupee forms a part of Charitropakhyan and is a part of our nitnem and amrit sanchar ceremony. And the dohras from Chaubees Avtar compositions are a part of our Rehraas Sahib. This is how much Sri Dasam Granth is a part of our nitnem, amrit and ardas. However Dilgeer, like Darshan Singh Ragi, has the audacity to distort a fact and denigrate the Panthic traditions, and still claim to be savior of the Panth. When asked by the interviewer if the source of ‘Waheguru Ji Ka Khalsa, Wahguru Ji Ki Fateh’ is from Sri Dasam Granth, Dilgeer again blabbers that ‘Waheguru Ji Ki Fateh’ finds its reference in Rehatnamas and Guru Kian Sakhian written in 1780. The motto ‘Waheguru Ji Ki Fateh!’ is a gift given to the Khalsa by its father Sri Guru Gobind Singh Ji. He was the one who coined it and propagated it through his writings. It’s a treachery to claim that ‘Waheguru Ji Ki Fateh!’ was not the creation of our father the Dasam Patshah. The first banee where ‘Waheguru Ji Ki Fateh!’ appears in Sri Dasam Granth is Jaap Sahib. And every composition after Jaap Sahib starts with this motto. And now without any reference, rhyme or reason, Dilgeer in the interview declared that Dasam Granth came into existence 100 years ago in 1797! It seems Dilgeer has issues not only with the history of the Khalsa, but also simple mathematics and logic. The primary source of ‘Waheguru Ji Ki Fateh!’ is Sri Dasam Granth and is the creation of none other than Sri Guru Gobind Singh Ji. Only after its introduction in Sri Dasam Granth, it appeared in other historical sources of the Sikhs. If Dilgeer agrees that Jaap Sahib was written by Guru Gobind Singh Sahib, then his claim, that ‘Waheguru Ji Ki Fateh!’ was introduced in 1780, stands falsified. Throughout the interview Dilgeer seemed to be caught in the web of his own errors. Now under what external pressure Dilgeer is challenging his own work is something to ponder upon. Ironically some of Dilgeer’s own neo-associates have recently proposed that because ‘Waheguru Ji Ki Fateh!’ is from Sri Dasam Granth, it should be denounced. The detractors should first sit among themselves and decide where they stand. In the interview Dilgeer misquotes Bachittar Natak and claims that because the writer of Apni Katha mentions that he was sent to the World by Akal Purakh, because everyone before him did not comprehend the Supreme Lord, means that he is denigrating Guru Nanak Sahib along with other Guru Sahibs. I have been sent into this world by the Preceptor-Lord to propagate Dharma (righteousness). And before writing this, Guru Sahib meticulously and truthfully describes how those who were sent by Akal Purakhfailed to propagate His Naam and instead declared themselves as Lord. Everyone placed his own interest first and foremost and did not comprehend the Supreme Lord. And Guru Sahib has clearly written the names of those who didn’t follow the command of Akal Purakh of engaging the mortals towards their destiny of following only one Lord. Hence, when Dilgeer adds the name of Guru Nanak Sahib to that list, it’s basically him who is being a Guru Nindak. A few stanzas after that Guru Sahib in the same composition (Apni Katha) writes that his Dharma is the Dharmawhich was initiated by Guru Nanak. Guru Nanak spread Dharma in the Kaljug and put the seekers on the path. Those who followed the path propagated by him, were never harmed by the vices.5. Their sorrows, their wants were vanished and even their transmigration came to an end.6. Following this, Guru Gobind Singh Sahib clearly writes in Apni Katha that all the Guru Sahibs (from Guru Nanak to Guru Teg Bahadur) are from the same Jyot. And interestingly Bachittar Natak is one of the primary sources after Sri Guru Granth Sahib where all the Guru Sahibs have been described as being a part of one Jyot, stressing that “only saints comprehend this fact, and fools don’t”. Nanak transformed himself to Angad and spread Dharma in the world. He was called Amar Das in the next transformation, a lamp was lit from the lamp.7. When the opportune time came for the boon, then the Guru was called Ram Das. The old boon was bestowed upon him, when Amar Das departed for the heavens.8. Sri Nanak was recognized in Angad, and Angad in Amar Das. Amar Das was called Ram Das, only the saints know it and the fools did not.9. The people on the whole considered them as separate ones, but there were few who recognized them as one and the same. Those who recognized them as One, they were successful on the spiritual plane. Without recognition there was no success.10. When Ramdas merged in the Lord, the Guruship was bestowed upon Arjan. When Arjan left for the abode of the Lord, Hargobind was seated on this throne.11. When Hargobind left for the abode of the Lord, Har rai was seated in his place. Har Krishan was his son; after him, Tegh Bahadur became the Guru.12. The confusion that the detractors like Dilgeer has, is that they know what they are proposing is wrong. They understand that Sri Dasam Granth is an important source of history and tradition. However they would continue concocting lies and myths and sugar coat it with emotions in order to carry on with their divisive propaganda. However it’s not long before their assertions stand exposed. The most ludicrous and absurd assertion presented by Dilgeer in the interview is regarding John Malcolm. Sir John Malcolm was a Scottish soldier, statesman, and historian. He held various distinguished posts, including Ambassador to Persia, and Governor of Bombay. He was the author of several books regarded as authorities, including one about Sikhs published in 1812, called Sketch of the Sikhs, a singular nation in the province of Penjab. This book by Malcolm is one of the rarest reference materials on Sikhs of 18th century recorded by a western historian. After witnessing the tradition of Gurmatta at Akal Takhat Sahib, Malcolm writes in details on how the Khalsa convenes the great national council (Gurmatta). Among other things that Malcolm has written about this tradition, he notes that when the chiefs and leaders were seated in congregation there were two granths which were placed in front of them, ‘Adi-Granth’ and ‘Dasama Padshah ka Granth’. This is a rare eye witness account of the events at Akal Takhat Sahib including its maryada. Dilgeer in the interview agrees that what Malcolm saw and wrote was correct. However he claims that the Dasama Padshah ka Granth that Malcolm refers to is actually Sri Guru Granth Sahib. And Adi Granth that Malcolm talks about is the Kartarpuri Beerh of Sri Guru Granth Sahib. 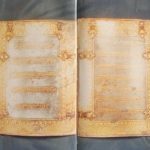 Hence according to Dilgeer the two beerhs which Malcolm writes about in his book are actually two different beerhs of Sri Guru Granth Sahib. Now one thing that is clear is that Dilgeer has not even seen Malcolm’s book. Had he seen the book he would not make this outrageous claim. This fact also collapses Dilgeer’s another assertion, copied from Jasbir Mann, that Sri Dasam Granth was introduced in Punjab in late 1800s. Dasama Padshah Ka Granth is the primary name of Sri Dasam Granth which was prevalent among the Khalsa in the 17th and 18th century. This title even appears on some of the oldest beerhs. Sri Dasam Granth was never addressed with the name ‘Bachittar Natak Granth’ as is being falsely propagated now by Dilgeer et al. Those who propagate this lie don’t even have any knowhow of the structure of Sri Dasam Granth which is the collection of various works by Guru Sahib, ‘Bachittar Natak Granth’ being one of them. Hence ‘Bachittar Natak Granth’ is a part of Sri Dasam Granth, but is not the old name of Sri Dasam Granth. It has become a past time of some of the renegade Sikh writers and preachers to comment on Sri Dasam Granth without even having thorough knowledge of its liturgy and study of its contents and languages. Classical example is Darshan Singh Ragi who recently got excommunicated for bad mouthing Guru Gobind Singh Sahib by concocting a story with the derogatory words that don’t even appear in Sri Dasam Granth. He had to pay heavily for his half-baked knowledge, and now Dilgeer is following the same track. Like an eye specialist would never perform a surgery of the ear, Ragis and writers should avoid judging Guru’s creations and writings if they can’t comprehend its meaning. There are candid scholars who have had years of study on various aspects of Sri Dasam Granth. If Dilgeer had any serious contention he, as a genuine writer, and a humble Sikh, could have contacted one of those scholars and cleared his confusion. But the fact that Dilgeer, like Darshan, decided to go public with his half-baked knowledge, just to stir emotions and confusion, only puts a big question mark on his main intent and agenda. Dilgeer had the audacity to go public with his false claims via an interview and get himself fully exposed. The story of Dilgeer is not different from renegade Darshan Singh Ragi. Both were believers until some time ago, who turned out to be traitors and turncoats and fell from grace. Only time will tell when, not if, Dilgeer will face the Panthic axe like Darshan Singh Ragi. *The author is a Panthic commentator who, over the years, has closely followed the modus operandi of those Sikh writers and preachers who have ‘switched sides’ and transformed from Panthic to anti-Panthic. He has thoroughly analysed those individuals who, for unknown reasons, started denigrating the Sikh ethos and preaching against their own beliefs.